Over 1000 local people from 3 wards of Bristol came together to sculpt a clay starling each. 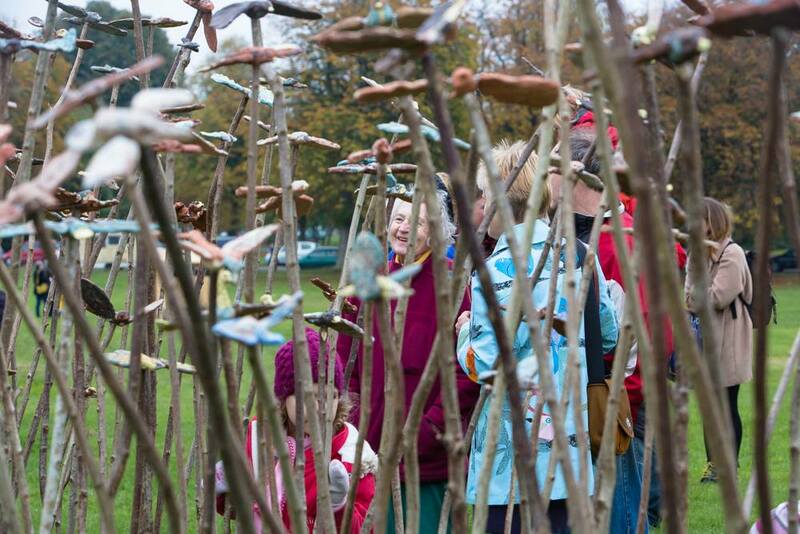 Created in free public workshops, these birds appeared en masse as a Bristol Murmuration, a stunning sculptural installation, on ﻿Durdham Downs, 17-27th October﻿ 2015. A response to the sharp decline in starling numbers and the absence of their once familiar aerial displays, each bird was individually made by Bristolians working together, of all generations, from 1-90yr olds. Our aim is to bring people together creatively to celebrate their wildlife, use their green spaces and find common ground. Volunteers staffed a bird hide to loan out binoculars and accompany the art installation. Volunteers did 2hr shifts in pairs -refreshments were kindly supplied by Waitrose, Henleaze. Birds have been low-fired on bricks, stacked in recycled vegetable boxes and individually mounted on locally sourced coppiced hazel poles. A local brick clay mix dug at Almondsbury, has been used. Tools have been made from old milk cartons and other household items. The bird hide is from salvaged wood. Other materials sourced from the Children's Scrapstore. This is a Bristol 2015 Neighbourhood Arts Project for Henleaze, Stoke Bishop and Westbury-on-Trym. 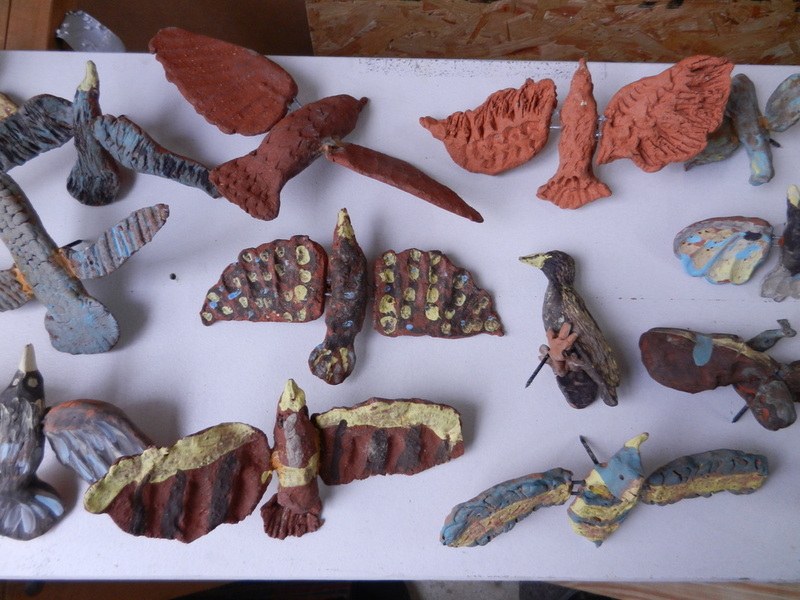 With huge thanks to Ibstock Bricks at Cattybrook, who have generously donated clay and fired the birds for us. UPDATE: Uncollected starlings appeared again at the Bristol Botanical Gardens 25-28th March. Flying for shelter towards the glasshouses, people got a chance to rehome a bird with all proceeds going to support charities working in the current refugee crisis. Huge thanks to all who contributed and for the Botanical Gardens for hosting. A total of £570 was raised for Medicines sans Frontieres & Help Refugees. See BBC News: a Bristol Murmuration. 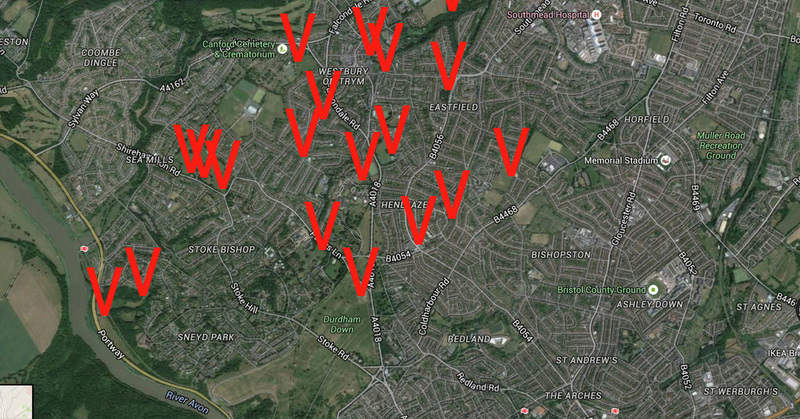 See ITV News: a Bristol Murmuration, and here. Read: Time Out's 'Must See exhibition'. Read: Henleaze & Westbury Voice. Also on installation. ​*The birds were distributed amongst 3 venues for relaxed collection in a 2 week period finishing 16th November. Unfortunately individual collection is now closed. The last birds are now in deep storage whilst more permanent venues are found for the remaining flock. All ideas welcomed with preference given to local venues within the wards. 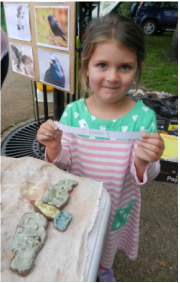 Over 600 people collected their birds...any photos of their new homes would be much appreciated. Please post to the Facebook page or email zoe@zoecameron.com. Birds are weatherproof and fired to 1100℃. Poles will need replacing eventually or bases can be trimmed. Birds are mounted on screws which are inserted into drilled holes within the hazel poles. For broken parts: recommend araldite glue or similar epoxy glue. You created such beautiful birds. It's been a joy working with them and meeting you all. NEW: Young Bristol is now supporting us by designing a flapping card/paper starling template which people can download, cut out and decorate to join in the opening procession. They have contacted all the schools in the 3 wards to promote this activity and will be holding a one day workshop creating them. Download the Murmuration worksheet here and make yours at home! No time? There will also be an opportunity to make one at Cafe Retreat with the Avon Gorge and Wildlife Project from 10am 17th October. Sat 17th October Opening: Meet 10am at Cafe Retreat on the Downs. Sun 18th October Starling Stroll on the Downs (walk) 10-12am. Learn more about the birds that inspired the art installation on this guided walk with Richard Bland from the Friends of the Downs and Avon Gorge. Along the way discover fascinating facts about starlings and the other birds that can be found on the Downs. Free but booking essential. Ring 0117 9030609 or email mleivers@bristolzoo.org.uk. Facebook event page here. Wed 21st October Parent and Child Starling Stroll 10.30-11.30am. ​Toddler friendly! Dependent on demand. Please register interest on 0117 9030609 or email mleivers@bristolzoo.org.uk. Facebook event page here. 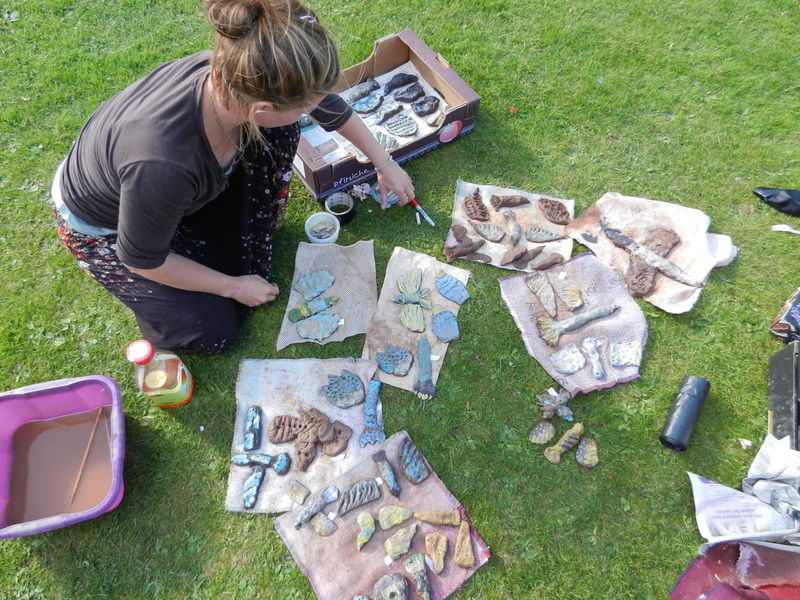 Free public workshops with technical guidance have been held across the areas in public green spaces. A cross-generational project, each bird has been individually numbered and stamped to aid identification. Participants can collect their bird for domestic roosting after the Murmuration/ end Oct. More details will be given nearer the time. Bennett's Patch & White Paddock Nature Reserve, the Portway. Make at home or in a group. If making indoor sculptural pieces that don't have to be handled it's quite possible to burnish (rub with the back of a spoon or smooth pebble when clay is leather hard), or paint as normal if desired. This can last for years without being the air-drying variety or being fired in a kiln. 30 July/6/13/25 Aug. Creative Shine Holiday Club, St Ursula's, Henleaze. 15th Old Quarry Park, Henleaze. Lovely play park here. 17th Henleaze Library. Reading room. 19th Fallondon Way Play Park, Henleaze. Gazebo. Great facilities at this new play park. 20th Stoke Lodge, Stoke Bishop. Garden gazebo. Near the new playground with zip wire. 24th Stoke Lodge, Stoke Bishop. 30th Canford Park. Gazebo. Near the play area and cafe. 2nd Stoke Lodge 9-4.30pm. Garden gazebo. 5th Westbury-on-Trym Village Show. 11-5pm. Garden gazebo. Next to the Morris dancers! 8th Elsie Briggs House of Prayer, Westbury-on-Trym. 2.30-4.30pm. Garden gazebo. Relax at this peaceful 15th century gem. 10th St Monica's care home, Cote Lane, Westbury-on-Trym. 2.30-4.30pm. Residents only. 12th Party-in-the-Park, Golden Hill Sports Pavillion, Henleaze. 12-6pm. Under a gazebo. Fun for all the family- plenty of activities! 13th Bennetts Patch & White Paddock nature reserve, Portway. Car-free Portway Sunday! 12-4pm. Lots going on at this Pollination event. 20th Badock's Wood: Green Hidden Treasures Celebration* 2-5pm. 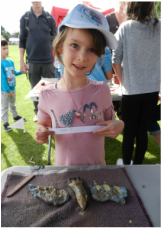 A variety of activities; a bird walk, new chainsaw sculptures and us! An instruction sheet and register to sign off is next to each batch. Please ensure you are collecting the right numbered bird! Please handle the birds carefully- they are fragile and have sharp screws attached. Boxes arranged in 100s. Drilled hazel poles are near with an honesty box: £1 each pole please. Bring lopers if want to custom length. *IDENTIFYING YOUR BIRDS: Every bird is stamped with it's number 3 times- usually on the underside of body and wings. Please check your records and sign off register at each collection point. Continue around the back- birds and hazel on grass along the wall under a tarpaulin. Pedestrian access all hours. Carpark opening hours only. Good playground adjacent. ​Address: Shirehampton Rd, Bristol, Avon BS9 1BN. 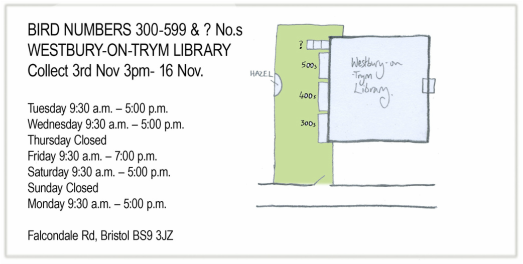 ​NUMBERS 300-599 & Unidentified birds: Tues 3rd Nov 3pm+ Westbury-on-Trym Library garden. Access through the gate in library hours. ​Address: Falcondale Rd, Bristol BS9 3JZ. ​NUMBERS 600-1012: Fri 6th Nov midday onwards- 16 Nov.
Eastfield Inn garden, 219 Henleaze Rd, Bristol BS9 4NQ. ​Birds will be cordoned off to ensure children don't handle unsupervised. Near the rabbits! Great family-friendly pub. Any birds/hazel not collected by 16th Nov will be taken away. ?Can't find your bird? Check WOT library- some numbers were lost before stamping due to a water-soluble pen and were given new odd ones. Only about 3 disappeared over the installation period. 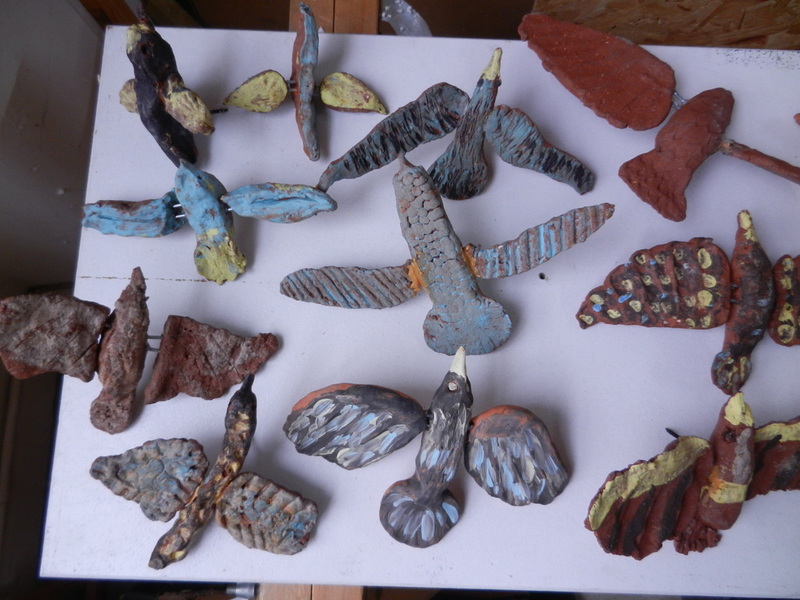 A few birds were joined to the wrong wings- most of these have now been identified/ swapped/ placed together to be joined by owners later. Wrong/no numbers birds in 2 boxes at the end. We want you to be reunited successfully for some peaceful roosting... thank you for your patience! Any photos of their new homes would be much appreciated. Please post to Facebook page or email zoe@zoecameron.com.